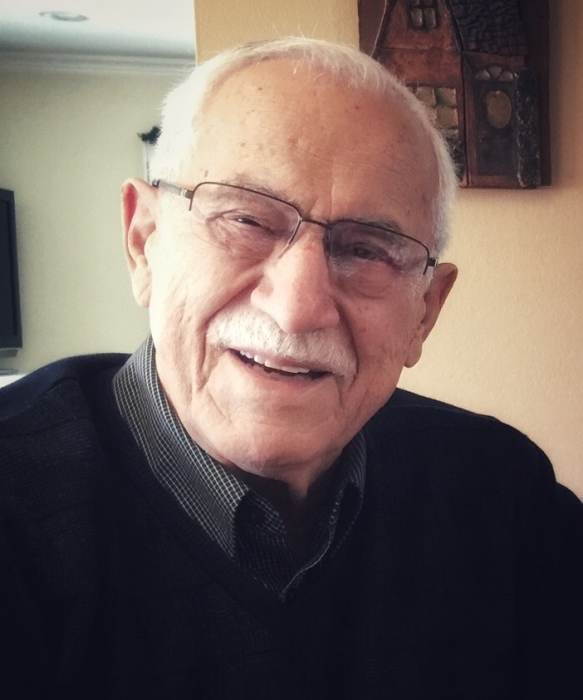 Joseph “Joe” Robert Enos, Jr., 89, of Orange, passed away peacefully at home surrounded by his loving family on January 16, 2019. He was born in Provincetown, Massachusetts, April 10, 1929, to Mary Tasha Enos and Joseph Robert Enos. In June of 1948, after graduation from high school, he enlisted in the United States Marine Corps. After completion of Boot Camp he was assigned to Marine Corps Barracks at 8th and I, Washington D.C. While stationed there, Joe was an Instructor in the Marine Corps Correspondence School and was a member of the Marine Corps Ceremonial Drill Team and Presidential Honor Guard (1948 to 1952) during the administration of Harry Truman. In 1952 he was assigned to the American Consulate, Jerusalem, Palestine as a member of the Marine Corps Security Guard Detachment. While in Jerusalem he met his wife, Oralie Baker and they married in January of 1953 in Terra Sancta Chapel, Jerusalem. In 1954 Joe returned to the United States and was assigned to the US Marine Corps Air Station, El Toro, California. In 1958 he was assigned to serve in Okinawa with the Third Marine Division and on his return he left the Marine Corps as a Staff Sergeant to pursue a career in Law Enforcement with the City of Santa Ana, California. In 1971 the family moved to Orange, California where they became members of Holy Family Cathedral. In 1977 he received his Bachelor Degree in Criminal Justice from California State University, Fullerton, California, and in the same year he was promoted to Lieutenant of Police. In 1985 he retired. During this time he served in many capacities at St. Callistus Church where he chaired the Annual Fiesta, and was a member of the Holy Name Society. Joe also assisted his wife in her many church activities. After Joe’s retirement from Santa Ana PD he continued to assist his wife in her church activities at Holy Family Cathedral. Joe was a member of the Men’s Fellowship, and worked at Mary’s Kitchen feeding the homeless one day a week for more than 20 years and as a Eucharistic minister to the sick. In 2002, he and his wife were inducted into the Equestrian Order of the Knights of the Holy Sepulchre, where he earned his Pilgrim Shell and attained the rank Knight of the Grand Cross. He was a loving husband, father, and friend who will be missed dearly. He is survived by his wife of 66 years, Oralie, his children Teri (Albert) Guerrero, Karen Bau (Bud Hubler), Mark (David Russo) and his brother Ken of Brewster, MA. A Funeral Mass will be held on Friday, February 1, 2019 at 12:10PM, at Holy Family Cathedral in Orange. In lieu of flowers the family requests that donations be made to Mary’s Kitchen or Holy Family Cathedral School.